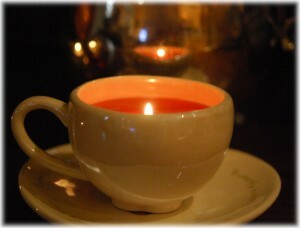 I posted a candle in a cup I did using Penny’s method, so if that interests you, please check it out here. It turned out so well, as you can see from the photo here (I did finally light it!) I’ll share it again! I get so many good ideas from other bloggers. Penny, at Planet Penny has such a fun blog, and in addition to good ideas and beautiful things to look at, it’s always fun to read. 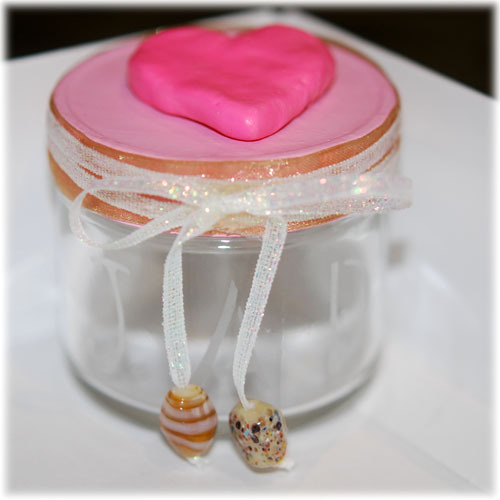 I have also been working on a little jar for a young boy for Valentine’s Day. It’s a little difficult to make things for boys for this particular holiday. Girls are easy, jewelry and well, everything just fits. I ended up making something not all that Valentine-like but it came out cute enough to share anyway. I didn’t take photos as I went, but it wasn’t rocket science so, I’m really just going to share a photo of the best part. The jar is a plastic jar that shaving cream comes in, then Mod Podged with green tissue paper. I put the boys name on one side and “Stuff” on the other –both cut with the Cricut of course because I could never cut letters out by hand. 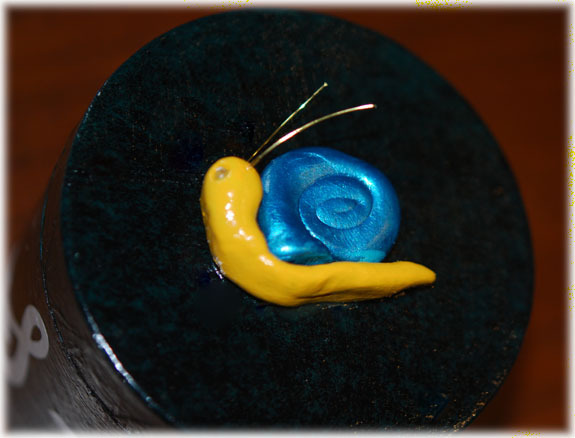 I then made a little snail with Sculpy and made him some antennae with copper wire I had in my jewelry making box. I used 2 little beads for eyes. I made the shell and body separate so I could paint them different colors easily, using acrylic paint. I attached him to the lid with hot glue, but he came off once, so I cleaned the hot glue off of everything and reattached him using hot glue and then put white glue around the edges. Hopefully he will stay put. He is so cute, I’m thinking of making some more and maybe painting a little smile on his face! I also made a Valentine’s Day card. I’m not going to mention who it’s for in case they see this (and this person does sometimes read my blog!). I’m not quite done with it, but I wanted to share what I have done so far because I thought it turned out not too bad. 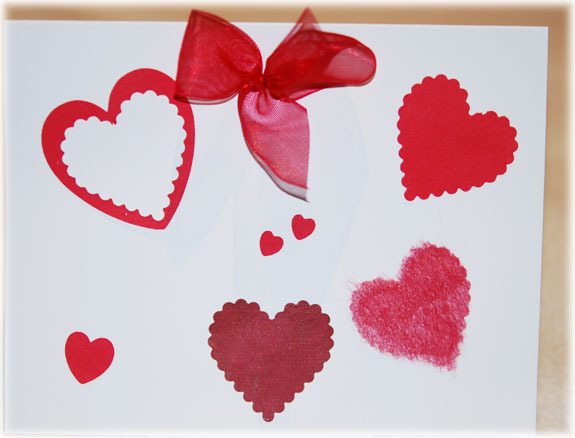 I really didn’t have much in mind when I started except that I had a bag full of red hearts of various sizes I had cut with my Cricut and I had a new tool (which I will tell you about in a minute) and some red ribbon. 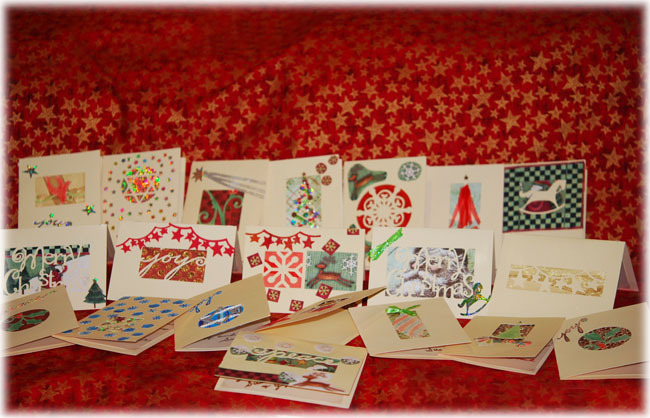 I started with a precut white cardstock (the kind that comes in sheets with 2 cards per sheet and you feed them through a printer–I have a package of them for making cards on the printer). 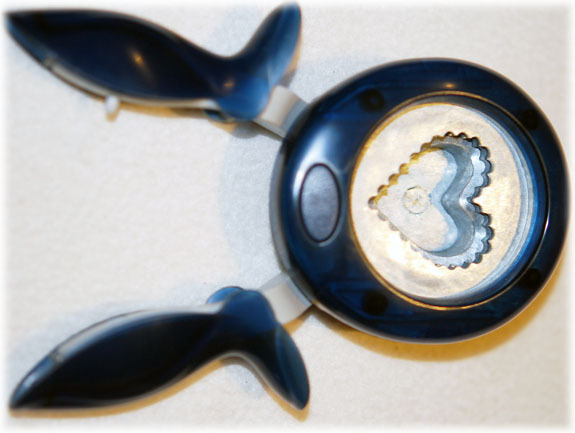 I used my cool new tool and cut out a heart “window” toward the bottom. I had a piece of red woven something that is, well, I don’t really know what it is. It feels like something between paper and fabric. I can’t remember where I got it, but it’s been in my “stash” for a long time. I glued it behind the heart “window” and then decided to try cutting a heart out of it with my new tool. That worked, altho it left the edges fuzzy and I had to trim it a little. Then I just added hearts until I liked the way it looked. I put the heart from the “window” inside one of the bigger red hearts, and let everything dry. Then I made a bow with some organdy ribbon and sewed it on. I hope I can mail this without crushing the bow too badly. Oh, my new toy, er, tool is a Fiskar’s Squeeze Punch. They are a little pricey, but they were on sale so I bought a couple of different ones. I love them because you can cut “windows” OR you can cut shapes. Just one more fun thing, and very, very easy to use. Only one more week until Valentine’s Day, so I had better get these things in the mail! More Sculpey, more hearts, more glass etching. 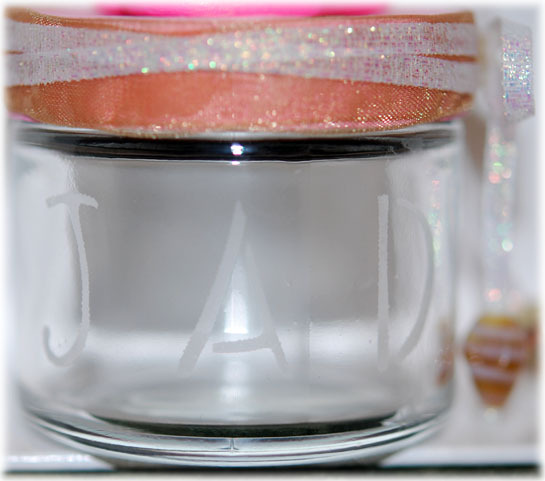 I did this little jar as a gift for my Great Niece. I thought it would be perfect for holding jewelry or other small trinkets, but I put a few Sculpey beads in there for her when I mailed it because she does make things. Then I used my etching cream. If you haven’t done that before you can find more info and tutorial here. 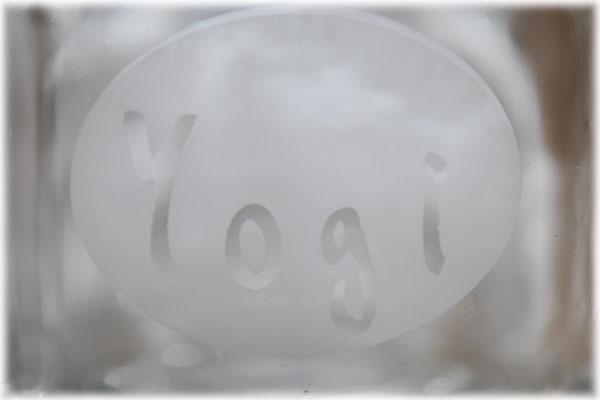 As always, be careful with the etching cream, remember, it’s strong enough to etch glass. I made a heart out of Sculpey and painted it pink with acrylic paint. I am not much of a Sculpey expert, I’m just following the directions on the box. It says to bake in the oven at 275 F for 15 minutes for each 1/4 inch of thickness. I am finding that it seems to need longer, but I also know from experience that you can burn it, so keep an eye on it. I set the timer and check it every 10 minutes or so. 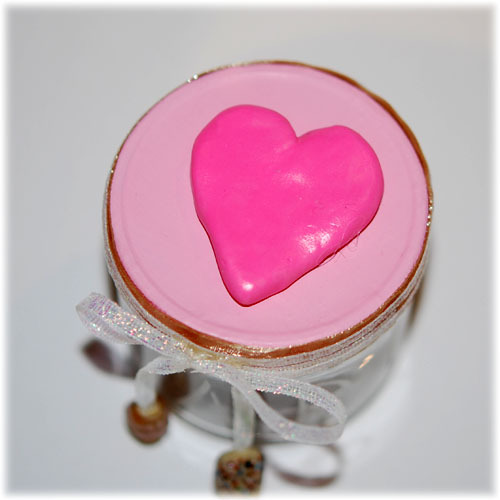 I used a lighter pink on the lid and sprayed both that and the heart with a couple of coats of Folk Art Lacquer to help seal and give them a little nicer finish. I used hot glue to attach the heart. Lastly, I finished the edge of the lid with organza ribbon wrapped around twice (glued with plain white glue) and then a thin white sparkly ribbon over that also affixed with white glue. Threading the little beads on the small ribbon was difficult! But I like the way it gave it a more finished look. I always have a problem figuring out what to do with jar lid edges. 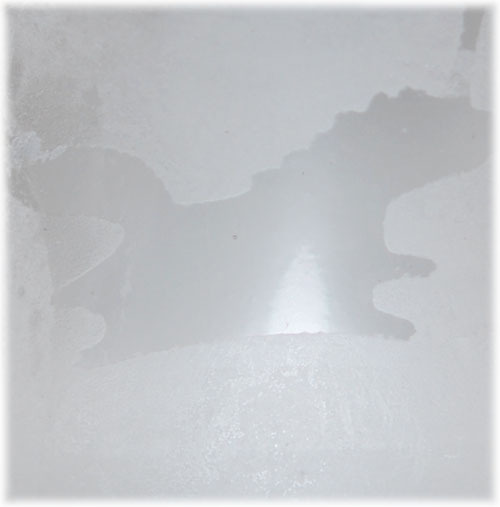 Oh, and I etched a little unicorn on the other side of the jar. Just because. 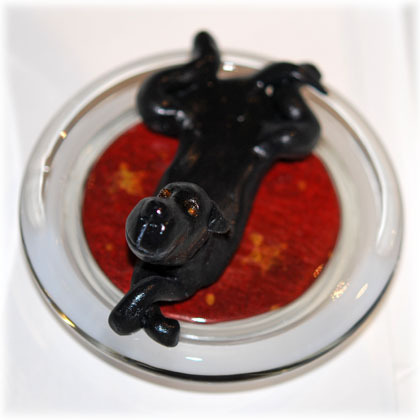 I promised a friend of mine a cookie jar for her Black Labrador, Yogi ages ago. I had thought I could find a nice large recyclable jar to use, but I never was able to find one. I finally bought the same type I used for cocoa last year, hoping it was made of the sort of glass that would etch. Of course with all of the crazy things that went on in my life in the fall, the roof leak, the kitchen redo, Christmas and being sick it sat there and didn’t get done. Until now. Originally I had simply intended to put his name on one side and maybe “cookies” or a picture of a dog, or a bone or something on the other. However I wasn’t thrilled with any of the picture options I had in any of my Cricut cartridges, and I didn’t think I could freehand something suitable so I decided to put his name on it and do something else. I thought at first I might be able to buy a little figurine I didn’t find anything I liked, so I gave up on that idea fairly quickly. 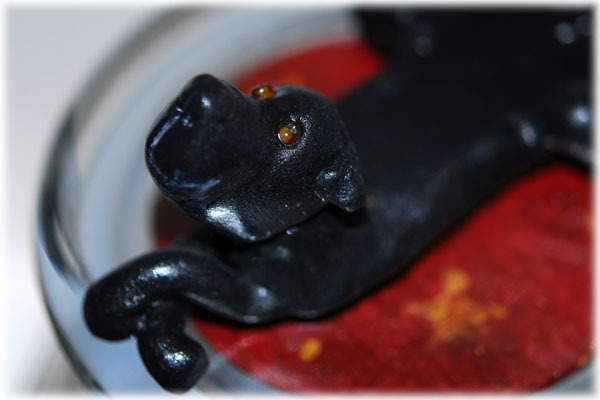 My sister-in-law does the most wonderful things with Sculpey clay, and I have a large stash so I decided to see if I could make a Black Lab for the lid of the jar. I had to call my sister-in-law for advice, but I’m pleased with how this turned out. I didn’t take photos as I went along, so no tutorial. For an etching tutorial you can look here. I will do some more Sculpey and do some tutorials on that, it was really fun. My SIL does AWESOME stuff, and I wish she would do some tutorials for me! BTW it IS time again for Handmade Monday! 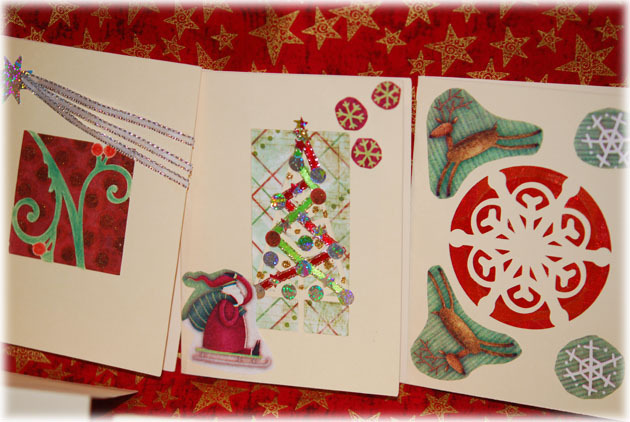 Pop on over and check out all of the wonderful things everyone is doing. I know we are all right back into the swing of things. I’m going to go myself and get a few good ideas! 🙂 Thanks for stopping by. One more card. This one sort of made itself. 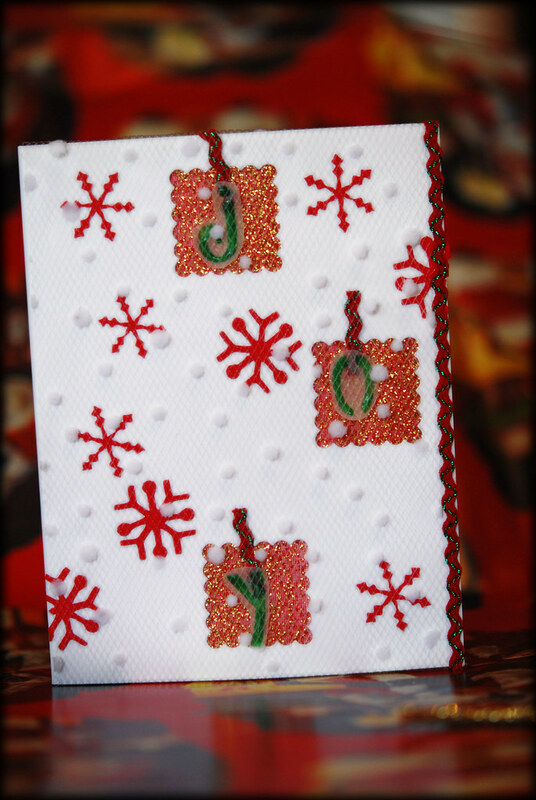 I had the letters for JOY made from Mod Podge and food coloring –I think I need to do a blog on that, but not today. I wanted to do them in simple cut outs in the card, and it just started from there. It kept just needing *something else*. 🙂 That’s really my favorite way to work. 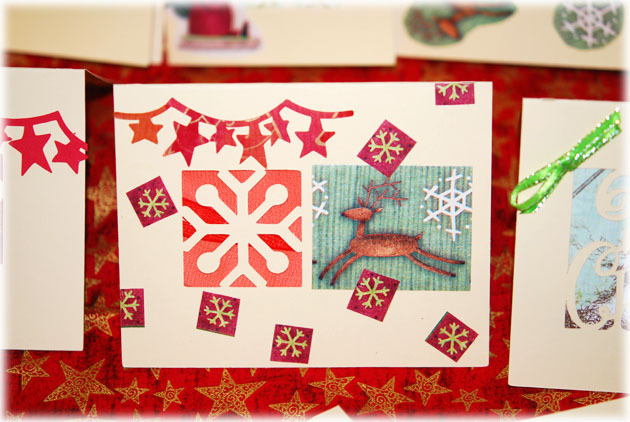 I ended up using ric rac and lace and glittery ribbon (behind the cut outs) and some snowflakes left over from making gift tags. I glued the lace down on the dots, and amazingly that worked. I cut it big enough to go all the way around the other side so it’s very secure. I won’t go into details about the making of them, since eat one was different. 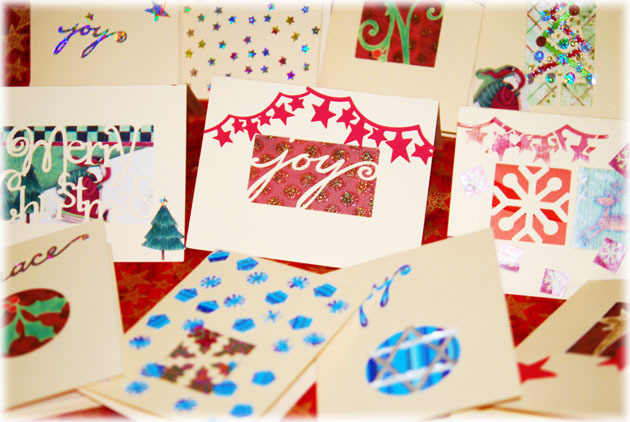 I will just admit to using my Cricut (and I will post a photo of it soon for those who don’t know what it is) to cut the cards and the words and some of the shapes. I also cut out things from wrapping paper, and leftover Christmas cards from other years, ribbon, and fancy pens, colored pencils (altho sadly I cannot find my good artists colored pencils, they have managed to hide themselves somewhere in the craft room mess, but I know they will turn up). I wrote the messages on vellum paper that I had from another project because I was afraid if I tried to write directly onto the cards I would mess up and have to throw away cards I spent a lot of time on. I spent a great deal of time deciding how to affix the vellum into the card, but finally settled on the little corners you can buy to put photos into scrap books. 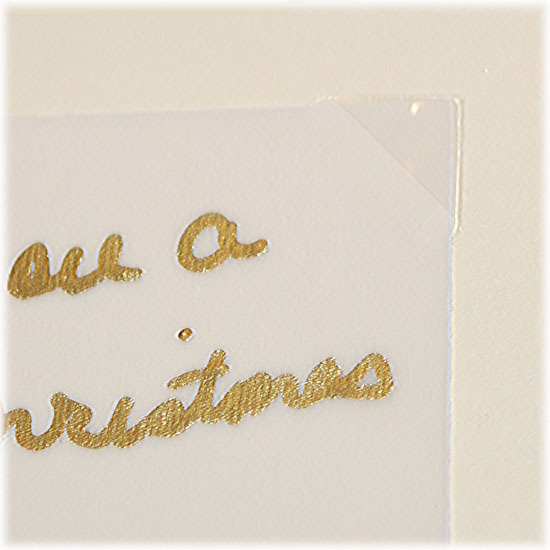 This has the added advantage of not only looking nice (they basically disappear on the page if you use the clear ones) but the recipient could recycle the card if they wanted to by removing the greeting and putting their own in there! Or, even replacing it with a photo. It was an accidental idea, and I have to give my husband credit for pointing it out to me. I should also mention that he’s the one who cut out all the vellum for the messages too. He’s a wonderful partner because he never seems to mind those mundane tasks that make me crazy! Now, go and check out the other Handmade Monday crafts. I am going to, and then I hopefully will post a few other things over the next week. 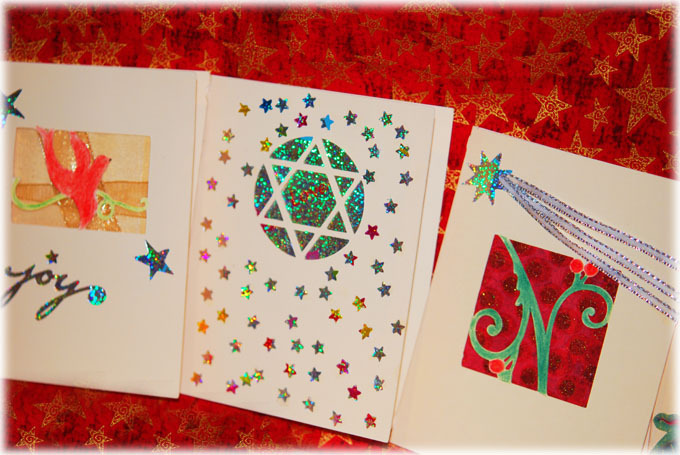 I have done a few other Christmas Crafts. 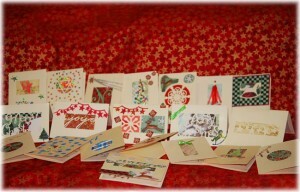 Once the cards are in the mail, and I have my Christmas shopping done (closing in on it!) my only other big project is little kitchen thing that is going to disrupt the entire house, I’m afraid. So, I will either have lots of time to blog, or I will be nowhere to be seen. I’m not sure which. So, I just thought I would take a photo of what I’ve done and what I’m working on. 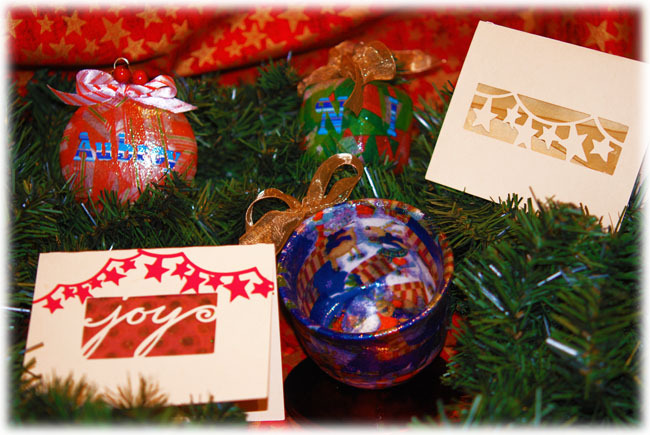 My Step Grand Daughter asked for a Mod Podge ornament and so I made one for her and her brother –they turned out well, I hope they like them. Then someone else made noises about wanting one of the Mod Podge cups, so I went ahead and made a special one for THAT person and will get that off in the mail right away. Anyway, if you’ve stuck with me this far, please head over to Handmade Monday and check out what everyone is doing. I know everything there probably has the glue in the right place and they usually cut their lines straight! 🙂 I’m going to check them out! I love Yankee Candle jars. They’re pretty and it always seems a shame to get rid of them. I generally put them into the recycle bin though, because I can’t think of anything to do with them. I had wanted to etch them, but I really thought they were made of some sort of Pyrex and couldn’t be etched. However, I discovered I was wrong! I can’t tell you how happy I am about this. I feel like dancing! Now I wish I had all of those I put in the recycle bin back! Oh well, it gives me a great excuse to burn more candles. 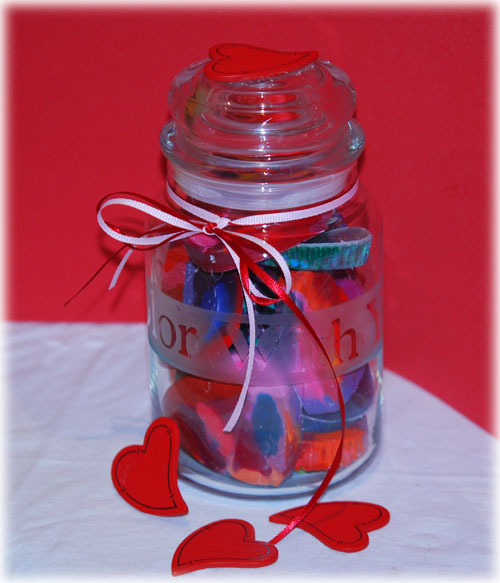 I think this particular jar with the heart crayons would be an awesome Valentine’s Day gift. 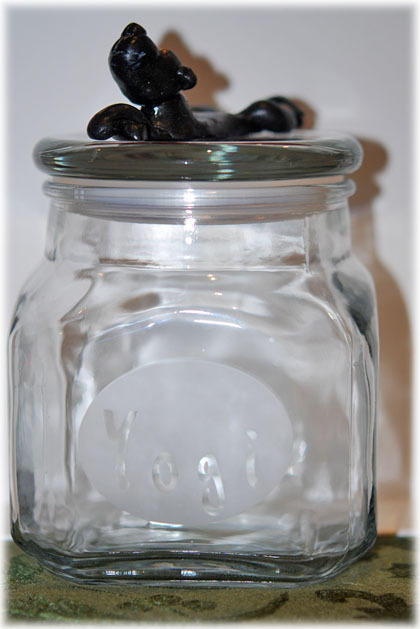 Check it out at Reusing Candle Jars. 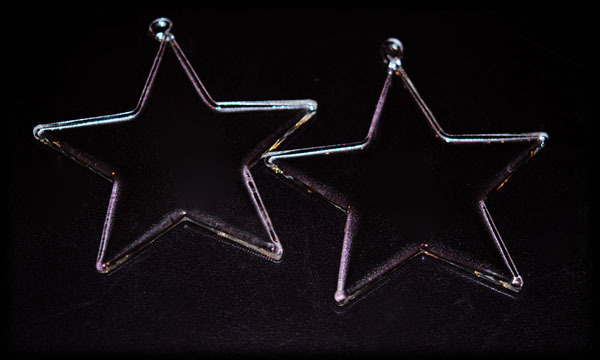 This is the continuing saga of the glass stars I worked on last week. If you want to go see why I had two glass stars to salvage you can go here for the rest of the story. I had to do something to cover up the slight etching you could see on the glass, and what better than one of my favorite things, Mod Podge? I used Christmas tissue wrapping paper that wasn’t really very Christmasy, but I love the colors. I’ve used it for other projects before, but I still have some left. I will hate when I use the last of it. 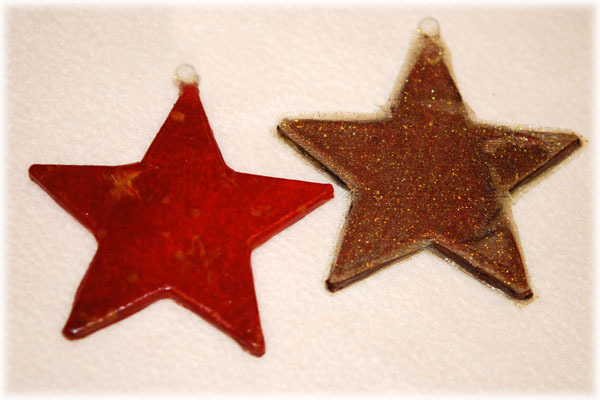 First I covered the stars with the paper and Mod Podged it on with several coats. On a whim I covered one with some gold tulle I happened to have, and Mod Podged over that too. Wow, nice sparkle! I needed to trim the tulle as close as I could to the edge of the star and build up the edges with Mod Podge until it was smooth. This took several coats, and time as it had to dry between coats. But I think it was worth it as it came out really sparkly! affixed those with Mod Podge and then decided it would be fun to have their names on the back. That wasn’t my original plan, but hey, if something seems right I like to go with it! So, I found an old catalogue with nice colors on the front. As a last touch, I put ribbons through the holes in the top so they an hang them on their door knobs (or somewhere else if they choose). I think they came out pretty well, considering they were rescued. I still think the etched stars would have been far superior, but when life hands you lemons, I think you just have to use Mod Podge! Don’t you hate when you have a really cool thing planned and you get all of your materials, and you do everything, and it’s working out so nicely. You go through all of the steps, and you even get awesome photos, and spend a lot of time doing exacting work. Then, you get to the end, and you say to your husband, “Well, etching never looks like it’s etched while it’s wet, but when it’s dry, the pattern always emerges!” ? I did discover something. 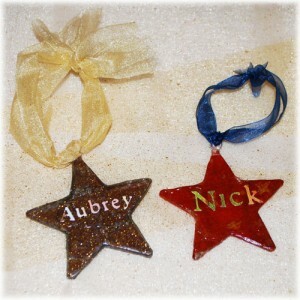 I had actually read it at some point, but never thought I had to check what my cute little star ornaments were made of. Let me go to the beginning, as you are probably a little confused. 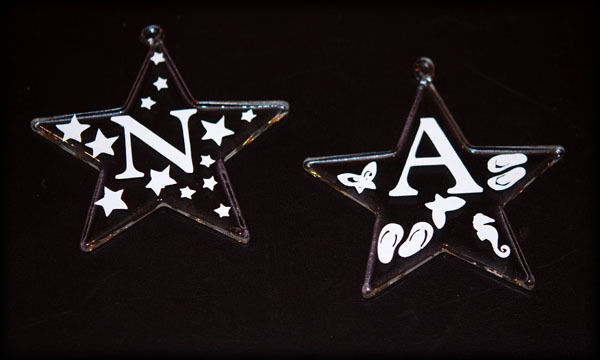 I had these glass star ornaments I bought before Christmas last year, thinking I would put my Granddaughter and Grandson’s names or initials on them. But I never got them done and so I put them away. Last week I had an inspiration. I would etch their initials in the middle and decorate them using my Cricut. 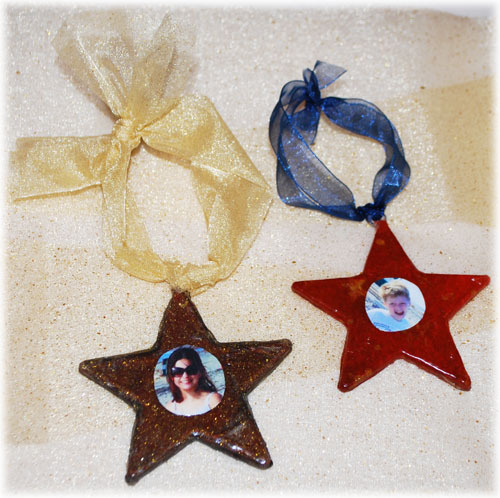 It would be a great project for Handmade Monday and a nice little gift they could hang on their doors with a ribbon. Great! 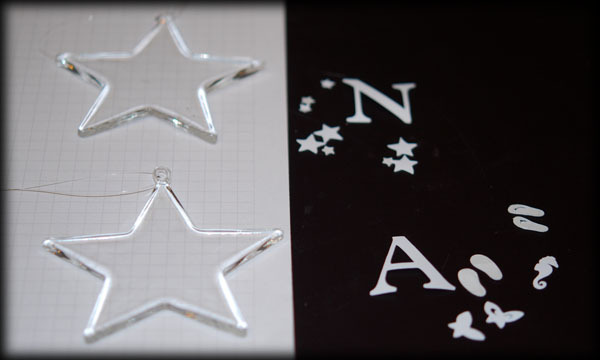 So, I cut out the pieces of sticky vinyl on my Cricut, arranged them ever so artistically, and took amazing photos! I slathered on the etching medium and waited the requisite time and a little longer. Then I rinsed and dried them. Disappointment! Nothing. Oh, you could see just a very slight and vague shadow in a few spots, but no, really nothing! I was crushed. What had gone wrong? OK, yes, I expect so. But, I thought I would do a little experiment anyway. I had an extra jar just sitting around waiting for a new life, and I really wanted to see what red looked like, so I went ahead! Well, it actually turned into something a little different. I like when that happens. I guess I will have to call it a Tinted Red Heart Jar.